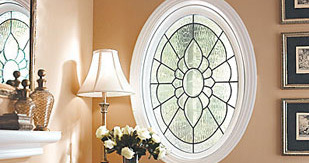 Stained Glass windows and wrought iron products for your home and church from one place! Stained glass is a timeless art. It is a perfect way to add a little extra to your home. The great thing is stained glass is very versitile. It can be used in doors, bathrooms, kitchens... pretty much anywhere needing either a little color, privacy, or both. We can produce most any design available, not just what's listed here on our design and gallery pages.CONTACT US for more infrmation. 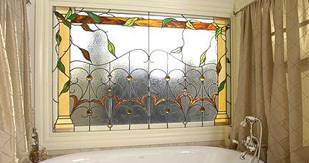 Spice up your home with a new stained glass window from BSG. Etched glass, always an excellent choice for your window! Etched glass is another option for your window. Stained Glass, though beautiful, is not for everyone, many people prefer the etched or as they call it "frosted" look. 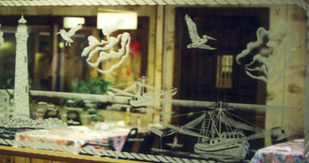 Etched glass provides privacy AND beauty and can be used in homes, churches and businesses. The process involves sandblasting your design on a clear piece of glass, the end results can be breathtaking! How much is my window going to cost? When figuring out a price, its best to begin by getting an accurate measurement of your window size needed, and a general idea of what you want. An average price usually is in the $100 per square foot range. Though for the most accurate pricing, just give us a call or come by we will be glad to discuss your job with you! Our DESIGN PAGE shows some of the more common and popular designs we offer. We also have an extensive, always growing GALLERY OF OTHER IDEAS. We also welcome custom designs. We can modify any deisngs you see with your own choices of colors and design modifications. The choices are unlimited! Most orders generally take a few weeks to get completed, though special circumstances can affect that. Sometimes it iakes less time, and sometimes more, depending on our current workload. We do strive to complete ANY job we recieve as quickly as is possible without sacrificing quality.